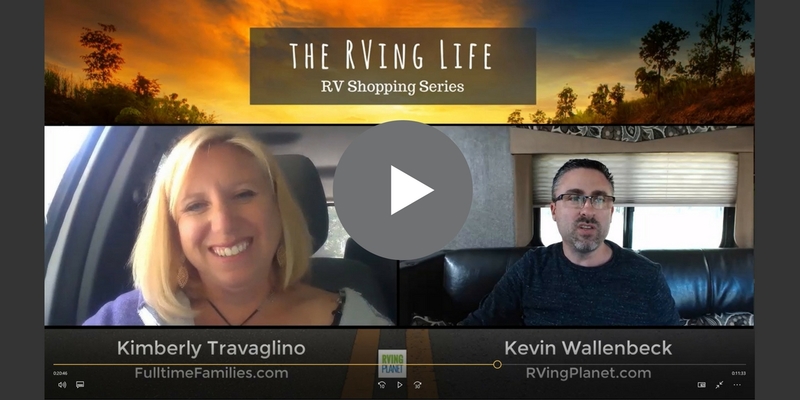 Welcome to the eighth episode of “The RVing Life Show”, where I interview Kimberly Travaglino of Fulltime Families, the author of “How to Hit the Road“, a comprehensive step-by-step guide for making your family’s full-time RV dreams a reality. She shares her families journey to buying their 3 different RVs and provides some helpful tips for new and seasoned RV shoppers. How most people buy their first RV and why you shouldn’t. What type of RV is the ‘gateway drug’ to RVing? The danger of getting a big RV as your first RV. Tips for deciding on the right floorplan. RV Buyer’s Worksheet – Get a grip on the RV buying process … get organized … your wants, needs, towing, REAL costs, and more! Road Ready Checklist – Leave your driveway with confidence. Don’t leave anything you need behind. A FREE downloadable resource you can use each and every time before you head out on your next adventure. 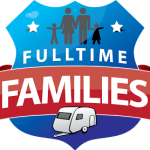 Fulltime Families – Make Your Fulltime RV Dreams Come True! Kevin: Welcome to another episode of the RVing Life, everyone. We’re so excited to have Kimberly Travaglino on the show today. I’ll introduce her and let her talk to you in just a moment. You can obviously see her there, but she’s the author of “How to Hit the Road – A Comprehensive Step By Step Guide. Making Your Family’s RV Dreams a Reality.” She also serves as editor of Full Time Families magazine, a company that supports risk takers, pioneers, and enlighten families blazing their own path across the country. Kimberly, welcome to the show. Kimberly: Thank you so much for having me, Kevin. Kevin: Yeah, I know it’s been a long time coming. We’ve been trying to get you on and just our schedules haven’t matched up. All the burdens of traveling full time in an RV, right? Kevin: Lot’s of blessings. You and Chris have been to some pretty cool places recently. Right now, you’re actually … I know we can’t see you. We can see you, but you’re sitting in a truck. She’s actually in Yosemite National Park and the wind was just a little too much for the microphone so she had to hop in the truck, but it’s a beautiful place there. Kimberly, just tell us about you, your family, and where you guys have been recently. Of course, I just mentioned … I spilled at where you are now, but just give us an update on where you’re at. Kimberly: Okay, my name is Kimberly, my husband is Chris, and we have four children ages 14 to six. We’ve been traveling since 2010. We are embarking in a few weeks on our seventh year of full time traveling. Kimberly: It’s been an amazing blessed adventure that my family has been on for the last seven years. Prior to leaving our house, we realized that families who full time RV were going to have challenges that were unique to this lifestyle, challenges that although our traditional counterparts might have similar challenges there was going to be some really unique challenges, internet being one of them. We founded a business called Full Time Families and that’s actually how we support our family and through that we support the thousands of traveling families on the road. Kevin: That’s awesome. Kimberly mentioned internet. We were having some trouble with that, too. It’s panned itself out. Hopefully, it will work out for us here. No, it’s really exciting. I know the first time that I met you actually was at the RV Hershey Show. Kevin: Well, the RV Show in Hershey, how about that? Kevin: I got to meet you and your husband real quick just on one of the side roads there. That was pretty cool. Where have you guys recently been traveling? Kimberly: Well, we hosted an event … We host nationwide events teaching people how to live full time on the road and connecting families who are already on the road with each other. We hosted an event in Tallahassee, then we booked it across the country to help Escapees, which is another group for RVers, host their event in Tucson. Now, we’re currently exploring California for the second time our seven years. We were here back in 2011 and we haven’t been back since so it’s nice to be back here and see some of the things we missed last time and explore some of the new things. We just were at the beach last week which was amazing. Now, like you said, we’re at Yosemite. We went from the beach to the mountains, which is what I love about my RV the most because sometimes it’s a beach bungalow and sometimes it’s a mountain cabin and sometimes it’s a hunting retreat. Whatever I want it to be, whenever I want it to be. That’s what I love most about my RV. Kevin: That’s fantastic. Out on the West coast then, where you guys are now, you said this is your second time there. Is there anything that you’ve done again that you’ve like a lot as a family? Kimberly: Yes, actually this is our second time in Yosemite. We’ve probably been to about 75 national parks and recreation areas across the country in our seven years, but Yosemite is our favorite out of all of them. It’s beautiful and easily accessible. It’s a landscape unlike any other. A lot of the national parks are so it’s really hard to choose, but I don’t know, when we pull in here we just feel something really special about this place so we’re back here. I will be going back to the coast of Oregon this summer where we spent … We have spent several summers on the coast of Oregon and we love it there too. Kevin: That’s fantastic. That’s pretty cool, you’re getting out quite a bit. Frankly, most of the people watching this show are not going to be full timing in their RV, right? Kevin: As you guys … As we’re going through and asking questions and stuff, I think it’s awesome you guys are full timers. We’ve had some other … A number of full timers on here actually already on the show and they just bring … You guys have such a wide breadth of knowledge and experiences, frankly, that those of us that maybe are more a week or two or we get the RV out 10 times a year versus living in it, you still have quite a wide variety of experience to offer the majority of our viewers. Explain to people kind of how you got into RVing and what’s your story behind that? Were you always an RVer? Did you RV as a kid? Kevin: What made you decide to get an RV and go down this road? He brought home this pop up, which we paid way too much money for, by the way. Way too much money. He cranked it up and I stood in it for the very first time and I looked in front of me and there was this little, tiny galley. I looked to the side of me and there was a wet bath, that’s a shower that’s also a toilet. Kevin: Okay, so the people who are new, they might not understand, a wet bath is one solid piece of plastic construction, right? Kevin: You sit in the toilet, also the curtain, and it’s a shower. Kimberly: Yeah. Two things going at once. Kevin: Not that you do both at the same time. That’s what it is, one unit, right. Kimberly: Right. One thing that viewers should know, when purchasing an RV, if you can, purchase an RV that does have toilet equipment installed because then it becomes a tax write off if you’re paying payments on it. That makes it an all inclusive unit, which essentially terms it as a second home as far as the IRS is concerned, then you can write off your interest expenses on that unit. Something to consider. That’s why he bought it, but I decided that we were never, ever going to use that toilet. We weren’t allowed, but we did. Whatever. Anyway, I stood in this and I saw these little attributes of it and two beds and a table, and from the soles of my feet to the tips of my head I was emblazoned, alive with this idea. I looked at the house, and I looked at the RV, and I looked at the house, and I looked at the RV, and I ran out of the pop up and I said to him, “We’re going to sell everything and live on the road.” He’s like, “no, we are just going camping on the weekends.” I said, “No, no, no, no. You don’t understand. We’ve done it all wrong.” He had a wonderful job at Citrix as a network administrator. We had kids in a wonderful school system. I mean, we were firmly entrenched in the middle class. We had done exactly what we were supposed to do and we were on an upward mobile spike and, “We weren’t going to give it all up,” he said. I said, “Oh, no. It’s all wrong.” I ran into the house and I Googled a million different ways, every ad word, every key word I could think of of families that lived on the road. I found little blogs all over the place, but I didn’t find one repository. Right there and then I said, “If I’m searching, I know other crazy people like me are searching. We’re going to build a repository. Even if we never go on the road, we’re going to build a place, a safety net for these families that have this idea.” I think if you’re really passionate about living intentionally with your family, I think you need to be supported. This culture is against that. This culture is all about distracting your from what matters most and when you’re made this choice to make this huge leap of faith to issue all of what culture tells you you should be going for and really focus on the time you have as a family, there’s no one out there to say, “Yeah, do that. Yeah, that’s a good idea. Yeah, here are the tools. Yeah, here are people like you.” I said … Actually, God put it on my heart and said, “Make a place for these families right now.” That’s what we did. We started making a place three years before we were even available to go full time on the road. He resisted me for 36 months, but every time he went to work, I would Craigslist everything we owned. He’d come home from work and stuff would be missing and he’d be like, “What?” I’m like, “I don’t know. We didn’t need it anymore.” Slowly, our house atrophying with furniture. It was going out the door. We went on a camping trip and he said, “Okay, I get it. I understand what you want to do. I’m ready.” I said, “Oh, wow. That is really good news.” He said, “Why?” I said, “Because I sold the bed.” From that moment, from the moment he said yes, it was three months until we were full time on the road, but it took me the full 36 months to just lay the foundation. Everything we sold, I put the money away so we’d have a little nest egg. I prepared emotionally and mentally so that’s how we got on the road. Kevin: Do you think that … Again, the average person watching this probably isn’t going to go out full time in their RV, but at the same time, I would dare say that probably more than 50 percent of people that own an RV would like to. Kimberly: Oh, I would say 100 percent of everyone that wakes up on Monday and says, “I don’t want to go to work today and sit in traffic,” might have an inkling of a dream of selling it all and hitting the road. Kevin: We’ll definitely put some links down in the resource section in the bottom of the post of the video. I know you have some resources that we can link to, as well. For those people that are looking to take that leap and make that transition, like you said, it took you … Obviously, as a couple, it took you three years to get to that point. It’s interesting, even people that buy RV’s … Now, your first RV was kind of a … With Chris buying it, was in the moment … What do they call that kind of a purchase? Kevin: Impulse buy. Totally, right? That turned into something dramatic for you guys. Most people, when they by RV’s according to the surveys that we do and the information we get back, they’ll take anywhere from 30 days to 18 months before they buy, to actually make that decision to purchase. Sometimes they’ll buy something and have something that they like … Well, that they “like”, and then they’re looking for the next one and that may take 18 months, three years, whatever. I guess that point I’m trying to make is, it’s okay to take your time. Kimberly: Absolutely. Yeah, it’s wise to take your time. Your RV is a tool for you to have quality time with your family or for you to have an adventure, or a journey, or an exploration. No matter how often you use it, it’s a tool for you so make sure it’s the right tool for your family or for your situation. Kevin: Yeah. You guys got the pop up first, talking about the right tool, you guys got the pop up first. Tell us about the journey that you guys have had through … Is it your second or is this your third RV at this point? Kimberly: This is my sixth RV. Kevin: This is your sixth RV? Okay. Walk us through that real quick because it hasn’t been that many years. Kimberly: No, it hasn’t been that many years. Kevin: Yeah, walk us through that real quick. Kimberly: We got the pop up and the pop ups are a gateway drug to RVing. You either love RVing in your pop up or you’re done. That’s it. It’s one way or the other. We did. We loved RVing, but pop ups are arduous, they’re hard to pack up because they have to compress so you don’t have all the space open that you do closed. They were arduous. It was arduous for us. One day, like three or four months into it, I looked at him as we were driving home from a camping trip. I said, “I love you and I love RVing and I hate this pop up.” That doesn’t mean a pop up isn’t for everyone. It just wasn’t the right fit for our family. We had young kids at the time so packing up meant we couldn’t focus on what they were doing. They were getting into all sorts of trouble while we were packing up. It just didn’t work out for us. That weekend, we headed back to the RV dealer and we traded the pop up for a hybrid. Kimberly: Which is hard sided camper with bunk ends because I, personally, love sleeping in the bunk ends. I feel like that’s camping. It’s just … There’s so much air flow, you get to really hear nature. I just love bunk ends. I wish they made a fifth wheel with bunk ends. I would buy it. Kevin: A bunk end was actually our first RV as well. I’ll tell you a little bit about that in a minute. Okay, so you said you loved sleeping in the bunk end because it’s basically a tent raised off the ground, right? Kind of like a glorified pop up. One of the things that I did not like about that was that it so many of these camp outs we went to, we’d end up at a campsite that had a stupid outdoor light on the corner. It lit up like the whole thing and I ended up putting a tarp over top of it just to make it dark. Of course, that cuts down on the air flow. Anyways, just crazy stories. Kimberly: Yeah, that is true. That’s absolutely true. We’ve had to have tarps when we had that. I didn’t even think about that. Kimberly: Also, reflective, we had to put reflective tarps on it because it beats down heat. Kevin: It just makes it an oven in there, yeah. Pop up, and then hybrid or expandable, they can them. What was the next one? Kimberly: Right. Then, our next one was a 32 foot. I, in my mind, thought, “We’re going to get the full time one right now.” I wanted a 32 foot pull behind, quad bunk. It was a Prowler. It had an island queen in the front, a super slide in the middle, and a quad bunk with no slides. I really loved that camper. It was a great set up for our family and I thought it would be a perfect transition for us to go full time with, but Chris hated pulling it. 32 foot behind an F150, it was like pulling a sailboat down the road. Every time … We had an equalizer hitch, we had sway control, we had everything. Except for the Hensley, we had everything you could have for the stability in the back and we white knuckled it every time we were coming or going. He said, “Nope, this can’t be our full time. This can’t be our full time trailer. The layout’s great, but it’s just too much to move around the country.” As you’re pulling it, you’re getting sucked into the semis that are going by or you know. Kimberly: It is. It’s really scary. If you’re going to have a 32 foot pull behind, which is a large pull behind, then you need a really, really robust like a 250 or a 350 to pull it with. Even though you can handle a 150 with it, the weight’s not a problem, you just a need a robust vehicle to be pulling it with, otherwise you’re going to get sucked into all sorts of traffic. Kimberly: Not a fun experience. Then, we called up … Each of these, we were either able to trade or upgrade with a limited additional investments because after the pop up, we started making better choices about how much money we were going to spend on these things. We started to getting values that were equivalent. We were able to flip a lot of them without any financial risk. Kimberly: We sold the 32 foot and went up to South Carolina to purchase a 35 foot Jayco fifth wheel, which was exactly the same layout as the Prowler, only a bedroom slide, and a super slide, quad bunk in the back with no slide. That was perfect for our family. We had a seven year old, a six year old, a three year old, and we left when I was eight months pregnant. Kimberly: Anyways, that was a great, great camper. I think 35 foot is a really sweet spot for people. It gives you the room you need inside, but allows you the flexibility of going to places like national parks that were built 50, 60 years ago before campers got this big. Kimberly: I really encourage people to look at the 35’s so no matter what you’re doing with your camper, the 35 zone is really the sweet spot in my mind if you’re a larger family, and you want some inside room, as well as to explore outside because that’s what you’re getting your camper for. It rains. No matter where you go, it’s going to rain, and you’re going to be stuck inside. That’s why I really like the 35 foot area. We had that for a long time. It was a great, great camper for us. Truth be told, I would go back to that camper in a heartbeat, but we didn’t know at the time what 42 foot was going to mean. We thought it was going to be, “Bigger must be better.” We upgraded the truck to a dually and we upgraded to a Cyclone Toy Hauler, which is 42 foot with a 10 by 12 garage. Kevin: Is that a Heartland Cycle? Kevin: I couldn’t tell. I couldn’t tell. Kimberly: I mean, in the long run, I still can go to 90 percent of the places I want to go. It’s because Chris is such an amazing driver that we get to go the places. If you’ve never driven an RV before, I strongly urge you not to go buy a 42 footer. They’re massive. They’re really massive and it doesn’t matter how big a parking space you have, you can get into some really big trouble and some costly repairs if you don’t know what you’re doing. We’ve seen that over and over again. People feel like they’ve got to go for the biggest thing on wheels and that’s an unfortunate attitude to have. Especially, if you’ve never pulled anything before. Kevin: Yeah. You mentioned the word “Hensley”. Earlier on, when you were doing bumper pull, which is called a tow behind. Hensley is like the “Cadillac” of the bumper pull hitches, right? I don’t have a Hensley and we have a tow behind and we have an equalizer as well. I was pulling ours with … I shouldn’t say this publicly. We pulling ours with a 2006 Durango. It kind of … You know the equalizer. We could only really go an hour, an hour and a half away from home. That got real old. Last year, kind of prepping for a little bit into the future, we did a 250. I stayed with … We actually did a Dodge 250 with a 6.4 hemi. It’s a little bigger. It gives us like 15,500 to tow it. For us, that next fifth wheel, not the next, but the first fifth wheel we get right after this one and the teenagers are out of the house, we’ll be able to tow that without a problem and be in good shape. We won’t need the Hensley thing. You mentioned the Hensley. I just wanted make sure people knew what that was. Okay, so you’re a mom and I haven’t had my wife on the show yet. I probably should do that. I know, right? She’s kind of camera shy, but she would do a great job. She loves the camping and she grew up camping. Anyway, as a mom and a wife, when you’re looking for an RV for your family, what are some things … I know you’re kind of passionate about the floor plan and the layout, right? Talk to the shoppers, people that are looking and considering to buy, what’s important about the layout, the floor plan? Kimberly: I feel, and we talked about cultural distractions, and I feel like RV manufacturers kind of fall into that distracting plan, too. They put in these bells and whistles that aren’t necessary, in my opinion, for a camper. A camper doesn’t really need five TV’s. You’re supposed to be having campfires outside not everybody watching their own TV inside. It’s not supposed to translate to a house on wheels. It’s, again, supposed to be a tool for you to have an adventure. What I really ask people to consider when they’re shopping is to just focus on the actual footprint of your RV, the living space of your RV. Everything in your RV can be changed. I know that some knew buyers will be like, “What? I don’t want to rip anything out.” If you find that the RV is not suiting you in the way that it’s been set up with the manufacturer … Here’s a secret, RV manufacturers don’t go camping. Ever. They don’t go camping so they don’t know what you need and don’t need. I have the most beautiful shoe closet in my RV and no pantry. That’s okay. I can store my cereal in my shoe closet, right? That’s why I really implore people to look at the foot print of your RV so that when you’re looking down, look at the living space that you have and the footprint of the layout. Then, also pay close attention to the built in storage. Those are the two things that I, personally, don’t feel comfortable changing. Obviously, I can’t change the wall space. I’m could go find a carpenter to change the built ins, but I don’t want to. I think that’s an expense that’s not necessary. As far as moving the couch, or moving the dinette, or ripping out the beds and putting in different beds, or whatever, I’m comfortable with doing that and I suggest that other people look for those opportunities too. Too many times people think, “Oh, this is how I bought it and for resale value, this is how I have to keep it.” Again, it’s a tool. If it’s not serving you the way that you think it should, then it’s not your RV. It’s not the right product for you. Kevin: Same thing, when you’re at home, some people tend to be cheap on their mattresses where they spend like a third of their life. It’s important to make sure those upgrades … I’m sitting at a couch right now that we know, the space that’s here, I’ve measured it, we know that once we have … We have three daughters. One’s married, one’s 19 in college, and one is 17, she’ll be a senior next year in high school. We know that once she’s kind of out and we start pulling this around a little bit more, further distances, this couch is going away and we’re going to put two little swivel chairs here, right? Kevin: It doesn’t look like everyone else’s. Kimberly: Exactly. It looks unique and customized. Kevin: Yeah, very good. I would encourage people to be careful with that because purple walls or turquoise walls are not going to increase the value. Kimberly: No, but white walls will. White walls and white cabinets, I mean, people will forego a lot of the things they want for white walls and white cabinets because it makes the interior look so much larger. Kevin: I know that there’s a lot of resources online on finding out how to do that. My wife’s actually looking at painting the back wall behind our bed. It takes some special materials to do that, to do it right, a little bit. I believe that’s what she was telling me. Kimberly: Yeah, you need Kilz primer. Kevin: Yeah, because you’re painting or if you’re wallpapering over the top of the wallpaper, there’s some special things you have to do. It just can’t be … You mentioned painting, you mentioned Kilz, and what else? Kimberly: Just two coats of Kilz primer, then your paint like a satin finish so you can wipe down the walls easy. You’re essentially painting your wallpaper. Kevin: Very true, very nice. Yeah, you can see the wonderful brown wallpaper, which comes everywhere. Kevin: These funky pillows, like who puts these in? I don’t know, man. I don’t even know. They’re okay because they’re here, but isn’t that funny? Awesome. Kimberly, we’re going to start wrapping it up here, but give us kind of one big thing. Somebody’s going to go out with their family, school’s going to end here in the next month for most of the country, and people are want to go camping. They’re going to start buying RV’s. A lot of them already have, right? If you’re out shopping for an RV, what’s one piece of advice you would give. Kimberly: My one piece of advice that I’m going to give is kind of unpopular, and that’s buy what you can afford in cash. If you want true freedom, it doesn’t come with a payment. Wouldn’t it be nice to know that the camper in your backyard is yours. You fully own it. In fact, I’ll never forget it, I was camping in my hybrid and someone with a pop up pulled up next to me and I had payments on my hybrid. She said, “This is my pop up. It’s not much, but we own it.” It was so alluring to me that they owned that. I would have traded them right then and there and you know how I feel about pop ups. It meant something to me. Currently, we own our camper and we own our truck. Kimberly: Who needs another payment? Don’t get sucked into another payment. There’s plenty of good campers out there that you can buy for cash. Buy it for cash and spend the money on the adventures of a lifetime. Kevin: Very nice. That’s fantastic. No, it’s great advice. I appreciate that very much. A lot of times, obviously depending on where you buy, that payment’s alluring. Especially, you mentioned too, that some of what we consider to be the “nicer RV’s” that have a lot of the newer amenities in them, kind of the flashy stuff, they can get pretty pricey. That payment’s definitely alluring to people. We own ours, as well, and our truck as well, and I totally agree with you. Living debt free is actually a whole different topic. Kimberly: I’d love to come back for that because it’s important to me. Kevin: I would love it. We are the same exact way. We’ve been able to buckle down and get there in our lives. We have the house and the RV still. We have both. Anyways, just as we wrap up, I just want to say thank you so much. Make sure you say thank you to Chris for taking the kids to the playground. Kevin: Obviously, this episode, everybody was notified in the beginning that we are sponsored by RVingPlanet.com and some of the floor plans that Kimberly had talked about earlier about looking at the floor plan style from the top down, actually RVingPlanet.com has every single brand new RV floor plan that exists in the entire industry. You can go to one site and find everything that’s available in the industry. If you want to know, give me every travel trailer with one slide, 7,000 pounds, island kitchen, outdoor kitchen. You’re not limited just to what a classified has for sale or what a dealership has for sale, you can find out who makes it and where to go find it. Make sure you guys take advantage of that. There’s lots of good searching opportunities on there. There will be resources, like I mentioned, down below as well. A lot of Kimberley’s stuff we’ll put down there, as well as some resources to some buying help, some free check lists, and some other things along the way. Well, that wraps it up for this show. Until next time, enjoy the RVing life. Kimberly Travaglino is the author of “How to Hit the Road“, a comprehensive step-by-step guide for making your family’s full time RV dreams a reality. She also serves as the Editor of Fulltime Families Magazine , a company that supports risk takers, pioneers, and enlightened families blazing their own path across the country.